The mechanism of self-sustained oscillations in laminar cavity flows has been well characterized; however, the occurrence of self-sustained oscillations in turbulent cavity flows has only previously been characterized by direct observation of flows. 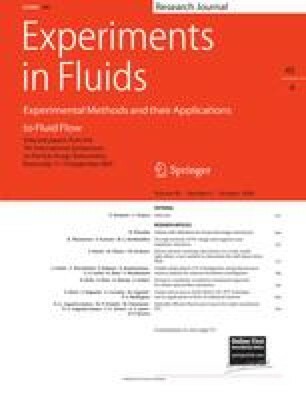 Here, the quantitative characteristics of vortical structures in turbulent flows over an open cavity were determined, and then statistical properties were examined for evidence of self-sustained oscillations. Specifically, instantaneous velocity fields were measured using PIV and wall pressure fluctuations were determined from microphone data. Cavity geometries of L/D = 1 and 2, where L and D are the length and depth of the cavity, respectively, were used under conditions where the incoming boundary layer was turbulent at Re θ = 830. Statistical analyses were applied based on the instantaneous velocity fields of PIV data. The spatial distributions of vertical velocity correlations (v–v) showed alternating patterns that reflect the organized nature of the large-scale vortical structures corresponding to the modes of N = 2 for L/D = 1 and N = 3 for L/D = 2. These values were consistent with the numbers of vortical structures obtained from a modified version of Rossiter’s equation. Furthermore the numbers of vortical structures determined in the statistical analyses were consistently observed in instantaneous distributions of the swirling strength (λ ci). The incoming turbulent boundary layer can give rise to the formation of large-scale vortical structures responsible for self-sustained oscillations. This work was supported by the Creative Research Initiatives of the Korea Science and Engineering Foundation.